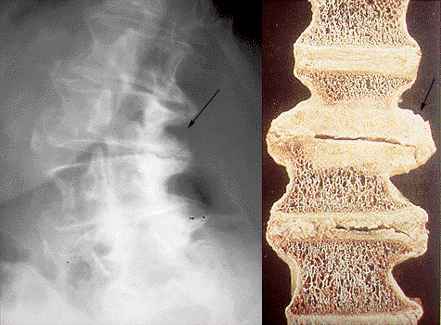 The left image is OA of the spine with resulting scoliosis. Note the asymmetric disk space as well as the large osteophytes which develop in attempt to bear some of the weight of the body (arrow). The right image is a photo of a gross spine from another patient with OA of the spine. Note the the large bulky osteophytes and subchondral sclerosis of the abnormal disk as compared to the normal disk above (arrow).